Mirror’s Edge Catalyst seemed like one of those games that was never going to happen, a sequel to a beloved game that wasn’t exactly a best-selling hit. Fans who’ve been waiting for more beautiful free-running are happy that it’s coming out soon but some don’t like how it’s handling its upgrades. The original Mirror’s Edge was sleek and spare, leaning hard on a minimalist approach to its visual and mechanical design. Based on the preview footage hitting the internet over the last 24 hours, its sequel seems to diverge from that just a bit, with regard to how it’s treating some movement abilities. You can see a quick glimpse the upgrade menu at about 7:46 in the clip below. When asked specifically about not giving players immediate access to basic moves such as Quickturn, Miller noted that by introducing it gradually, players tended to explore the new opportunities the ability provided more. “The quick-turn is a slightly more abstract tool and people didn’t use it as much [in Mirror’s Edge],” he said. It makes sense for new moves, especially combat ones, to be used as incentive to play and explore more. 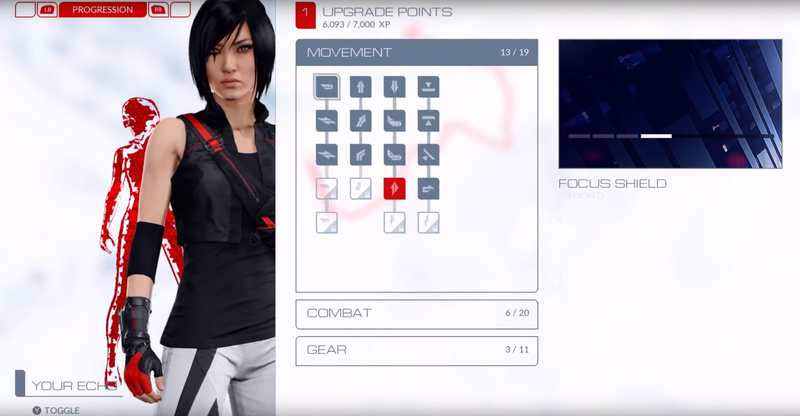 But doing the same thing for skill players could already use in the original Mirror’s Edge doesn’t follow the same logic. Folks everywhere will get to see for themselves how these changes feel when open beta hits on Mirror’s Edge Catalyst on April 22.